Being an Aquarius I can relate to this one, rest is the key, running around a lot can cause a lot of stress on your adrenals. Taking time to rest and receive a massage can rejuvenate yourself to take on more. Even God rested on the 7th day. Something I have noticed with people who do the-run-around-thing a lot is that their Strength Chakra or Solar Plexus is running to high. A common trait with these people is that they think it is all up to them and they have to do it because no one else can. With every issue there is a Chakra that is too high and a Chakra that is too low. Most of the time the Heart Chakra is too low. The Heart is about expressing your vulnerability and asking for what you need. So if no one can hear what you want, then it will be up to you to do everything yourself. So to balance this scenario, Ask for help!. In the end you will have more people around you to help you with what you need and as a result you will run around less and have more energy at the end of the day. A Medical Intuitive Session is best at least once a month for ongoing treatment.Twice a month is good for those that really want to get to the issue.. In regards to massage, it all depends on the nature of your injury or the state of health you would like to maintain. Once a month…is for those who like to prevent injuries and maintain current health. Twice a month…is for those who want to catch up to chronic pain and take care of old or new occurring injuries. Four times a month…is for those who are in the middle of injury treatment and have constant pain. Eight times a month…is for those that are in a debilitating injury and are in severe pain. ***This of course is merely a suggestion and appropriate consultation with your medical professional is recommended. Clients and I have experienced a positive improvement with toxin release: Glutathione, Zeolite, and the Ionic Foot Bath, all help with helping toxins move out of the body. Mental issues about release will also relate to the Gall Bladder and Liver in disseminating on what to let into the body. The Bladder will have issues on what to let go. The two together may have trouble working together if they are overloaded with toxins. Introducing antioxidants and cell wall pliability will help these two organs to work together. Ionic Foot Bath – The Ionic Foot Bath is a great detoxing machine which helps with extracting inorganic items in the body. The body has a hard time getting rid of these substances itself, so in this extreme time of environmental toxins, its takes an extreme machine. The Ionic Foot Bath takes out: Metal, Tobacco, Chemicals, Smog/Pollution, Yeast from Sugar, Mold, Viruses. Can help with: Weight Loss – Inability to Release toxins, Increase in immunity – more function back to the organ, Sore Joint Relief due to debris in joint capsules, Allergy relief, overloaded Liver and Kidney. After a 30 minute treatment you will not be able to see your feet due to the amount of toxins in the water. If you have any type of metal from traumatic injuries, such as plates, rods, or screws the Ionic Foot Bath is essential for the removal or metal from the body. It will increase circulation and take away the pain; the pain is the leaching of metal into the body. 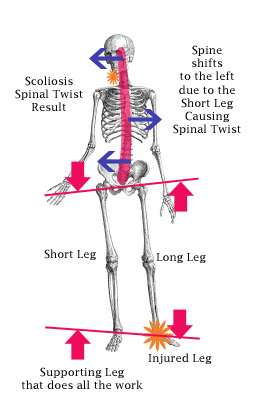 I believe most injury pain below the hips are due to the way we walk. Tight muscles in the legs will pull hip, knee, and ankle joints out of place. When bones are pulled out of place the joints don’t have enough room to move thus causing such symptoms as arthritis and excessive joint pain. Our mind tells our body how to move. If we are depressed you won’t walk upright and will start to lean forward. This will put more weight on your knees as your body has to counter the weight from always leaning forward. Walking upright and having correct posture technique will give your body more strength thus alleviating the stress one will put on there body. In the 80’s and 90’s it was Carpal Tunnel for Secretaries and Writers. Now the Current similar issue is “Computer Mouse Arm”. When spending 20+ hours at the computer one may notice how they continually holding up your arm. If a muscle is continually flexed for a long time while the user is in a state of stress that motion will become very tight. “Computer Mouse Arm” will be pain in the top of the forearm, bicep, top of the shoulder, and the area between the spine and upper shoulder. When these muscles get tight they can cut off the nerves to the hands causing tingling in the pinky and ring fingers. Notice when your are working at your computer and see how you are holding your arm up while it is doing no work. Become more conscious of this behavior and practice relaxing your arm while “Mousing”. People are becoming more aware of Ergonomics and sitting properly…however if you are in the same position and are in constant stress those muscles will become too tight…which in turns results in the “Snaps and Crackles”. That clicking sound is a result of your joint being so tight that the tendons cannot “snap” into the original position. 2 In a sauna do some arm stretches. 3. While at the gym work out the opposite muscles you use everyday at work. Flexing the muscles opposite of the tight ones will stretch out the “Snaps”. 4. While in a hot top move your arms in the water. The migraine or chronic headache occurs because the victim has been implanted on the etheric level. On the physical level they will tighten the muscles in the back of their head trying to defy being taken over. Over time the back of the neck will become very tight cutting off the blood supply to the head.